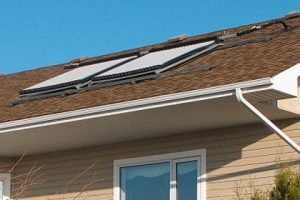 Whether you’re in need of a greener, environmentally friendly heating solution or are just exploring heating systems beyond natural gas or other energy sources, solar heating is an option to consider. There is nothing new about solar power, the sun has provided all the energy the earth has ever used for the last 4 and half billion years. All energy is the direct result of the sun's rays. A solar system can be as simple as throwing a garden hose on the roof of your house to help heat your swimming pool, to a complex million dollar system integrating roof panels, in ground thermal piping, and computer software. Significantly lower the impact on the environment. And to help lower Edmonton’s dependency on fossil fuels (as part of their long-term climate change goals). For more information on solar heating and green home possibilities in Edmonton, be sure to read the City of Edmonton’s Green Home Guide. Popular these days are solar powered hot water tanks for the cottage. Be the envy this summer of all your neighbors as you encourage the new generation the importance of energy conservation. Another form of green energy is thermal. Capturing the natural heat in the ground through a thermal pump. JW Brian Mechanical has worked on several of these over the years, with good reports from the owners. The beauty of these systems is that you can cool your home with them as well. If you would like to discuss how we can help you with your solar heating needs, feel free to contact us anytime.